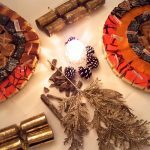 If you read my blog, you know that Ben and myself like to think of ourselves as foodies. And it’s not difficult. How many people say no to birthday and anniversary presents in exchange for a delicious meal in one of London’s many restaurants. Well, we both do. The results are always amazing. We love to surprise one another by trying to find the next most delicious place where our taste buds get spoiled with delicacies packed with flavours we wouldn’t have dreamt of in our wildest dreams. 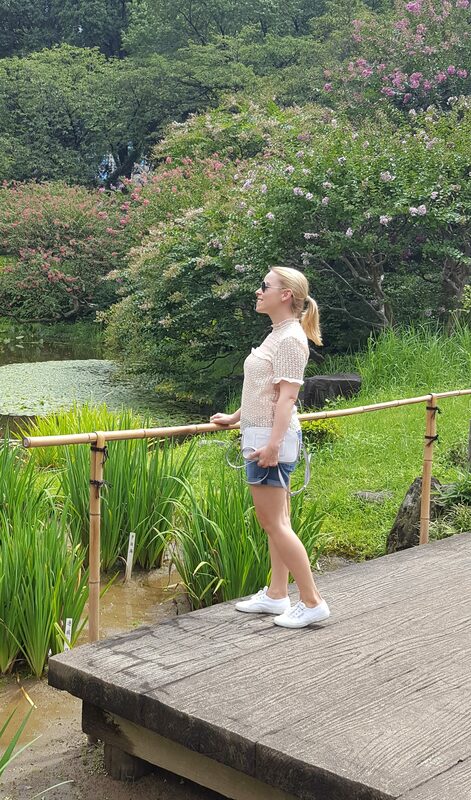 Having visited Japan in September and knowing how much I loved it and how amazing the food there was, Ben organised dinner at ROKA as my birthday treat. It was an excellent choice. ROKA serves contemporary Japanese robatayki cuisine and we chose the premium tasting menu at £88 per person and a couple of cocktails each seeing it was my birthday. 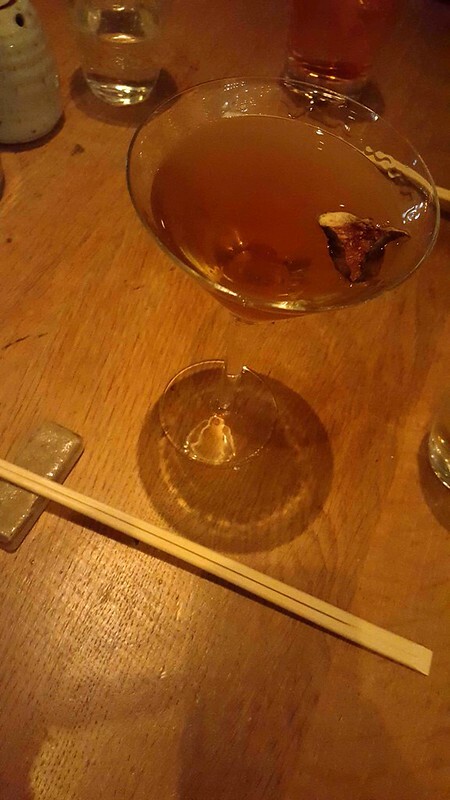 We really enjoyed the atmosphere, the open kitchen, where you can see the talented chefs preparing the food, the only hiccup happened when my gin based cocktail and Ben’s whiskey one were swapped and we both failed to notice. 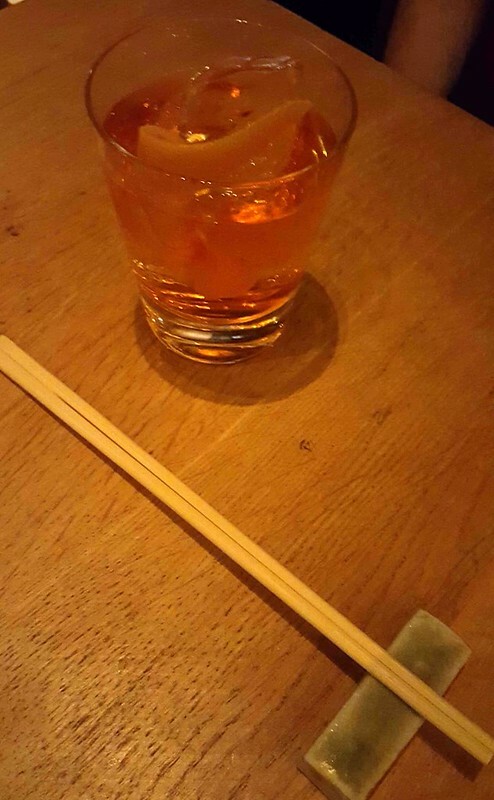 Luckily, the second time around we both got the cocktail we asked for. The food was absolutely amazing. 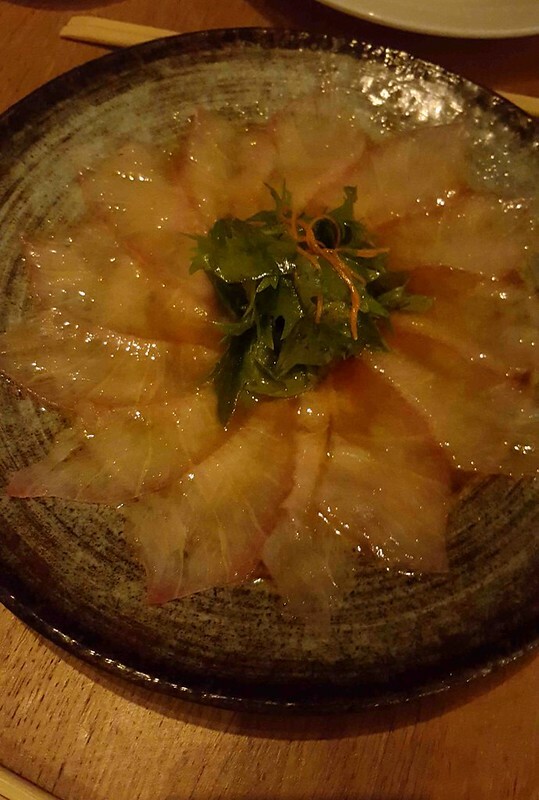 Neither one of us has been to ROKA before, so we didn’t know what to expect and we were both pleasantly surprised when kampachi sashimi no salada, yellowtail sashimi with yuzu-truffle dressing, found its way to our table. The fish was extremely delicate and the smell of the truffle dressing made my mouth water. 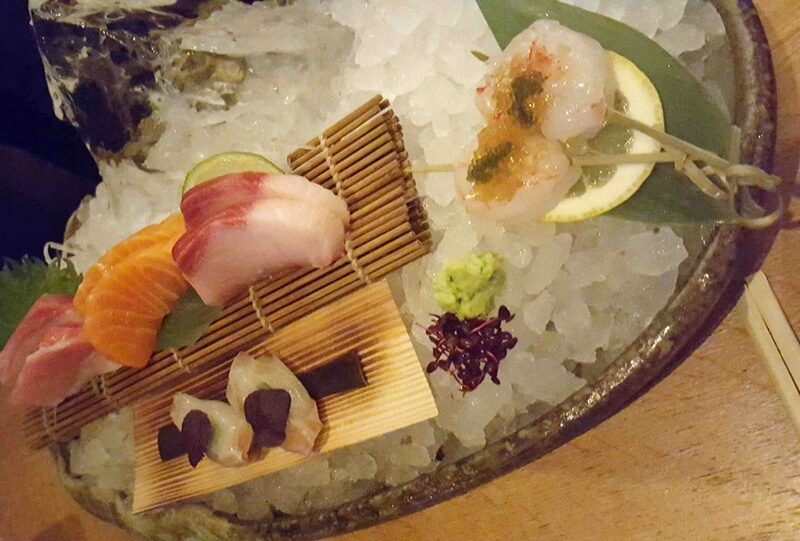 The first dish was followed by a sashimi platter and prawns. 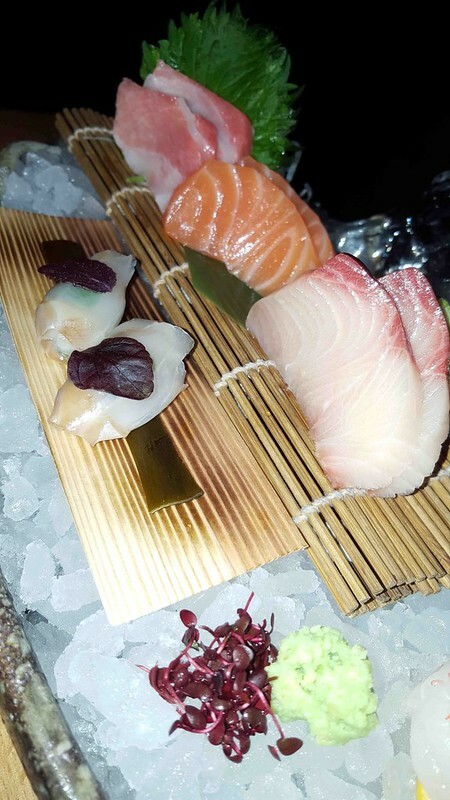 Aka ebi to tozasu, red prawn with tosazu jelly; susuki no kobugime to daikon, seabass with pickled daikon and plum sauce; and sashimi moriawase, a selection of 3 different sashimi. My absolute favourite was the fatty tuna sashimi. This cut of the fish is more expensive as there’s less of it in proportion to the whole tuna and it’s incredible, it falls apart, no, it melts in your mouth and I only wished there was more of it. If you get a chance, try some fatty tuna asap! Japan is known for its beef and it seems no Japanese meal experience would be complete without meat. 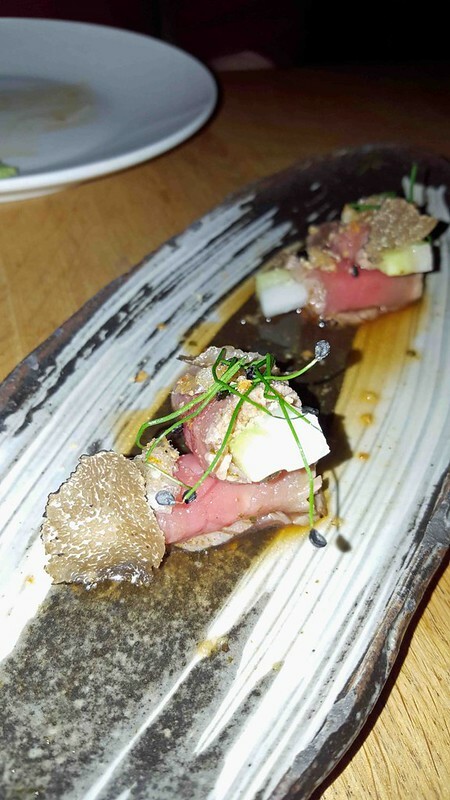 The gyu no tataki to truffle, seared beef with black truffle dressing, was very refreshing. It was wrapped around cucumber rectangles that gave the dish a good crunch and providing the much needed texture. While it was good and came with one of my favourite flavours, truffle, I wasn’t blown away by it. 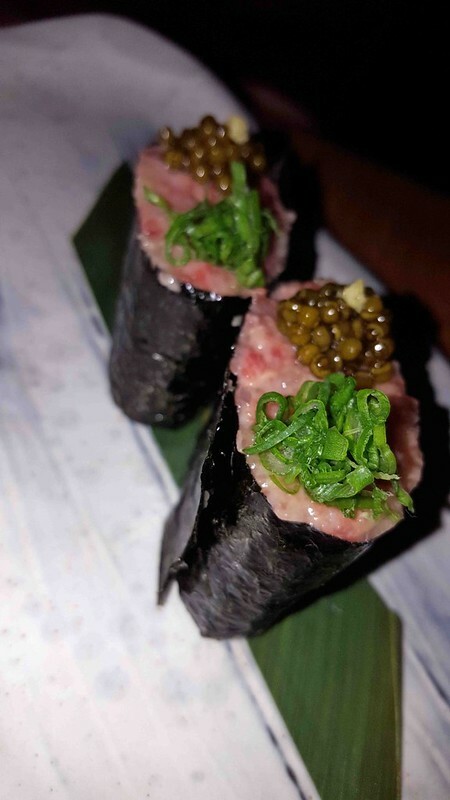 Wagyu gunkan is wagyu sushi with oscietra caviar. Oscietra caviar has a lovely subtle and a bit nutty taste and the caviar berries are smaller than the well-known Beluga ones. This was another dish that melts in your mouth and I loved the little contrast that caviar brought to the plate. 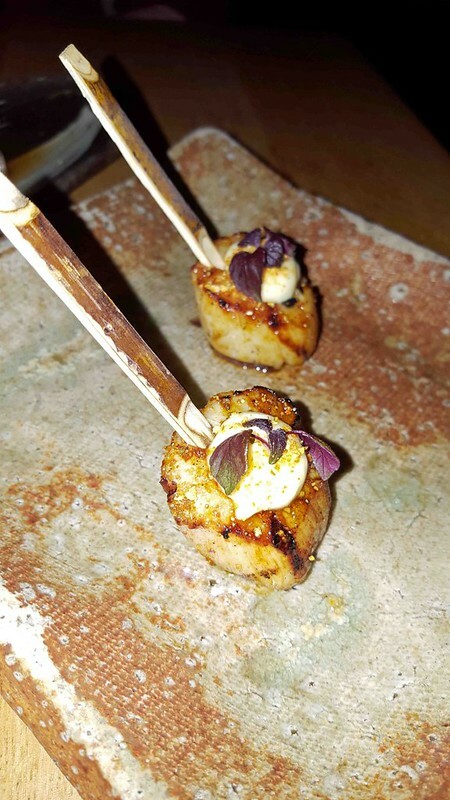 I’m a big fan of scallops, so the moment when we got to taste yaki hotate, scallop skewers with wasabi and shiso, was what I’ve been waiting for. The scallop was perfectly cooked, soft and full of the delicate, sweet taste that scallops are known for. While in Tokyo my friends took us to a delicious tempura restaurant, so neither of us could wait for ebi no tempura, rock shrimp tempura with chilli mayonnaise. 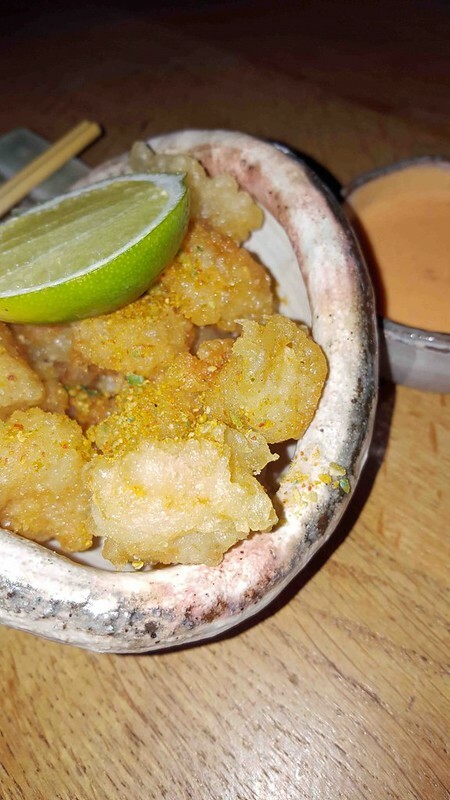 It didn’t disappoint, the batter and the chilli mayo packed a bit of a punch and I loved the crunch of the tempura batter. At this stage the food was coming out quite quickly and I’d prefer if it was a bit slower as I felt as if we’re not being given enough time to fully appreciate the textures and flavours that the chefs worked hard to achieve. 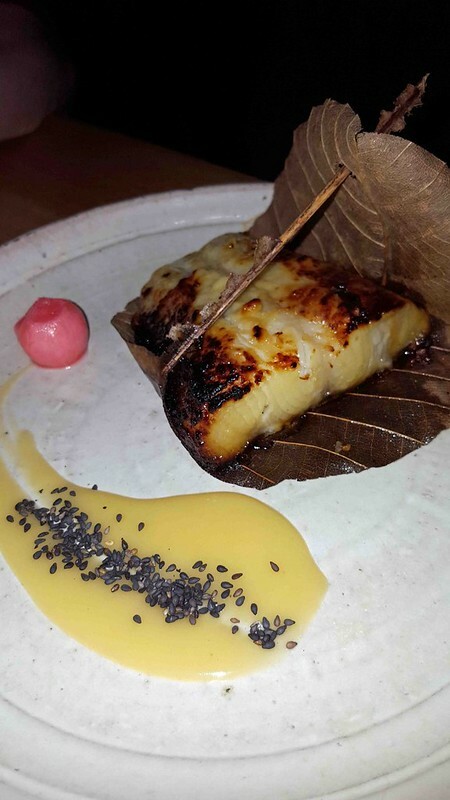 Our waitress did apologise for the quick service saying the chefs had the dishes ready, so they thought they may as well bring it out, but it was a bit of a shame as the incredible gindara bi saikyo-yaki, black cod marinated in yuzu miso; and baby gem no ginger shoga yaki, grilled baby gem with roasted onion and ginger, were getting cold in front of our eyes. The black cod was amazing though, marinated for about 72 hours, it fell apart and we enjoyed large flakes that packed so much flavour. 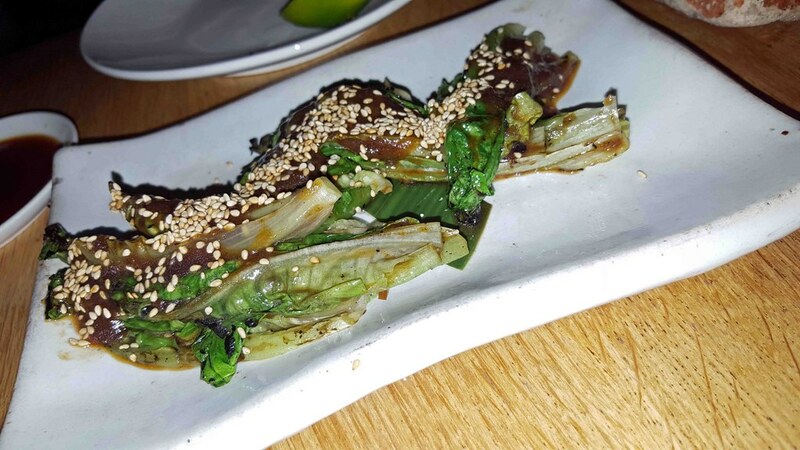 And grilled baby gem was a revelation, the taste was spot on, enhanced by the sauce and sesame seeds. 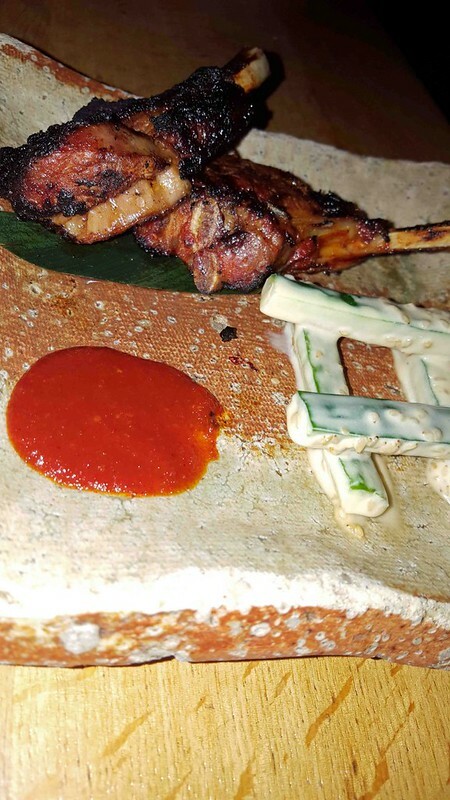 Kankoku fu kohitsuji, lamb cutlets with korean spices, were spot on too. The sauce was so hot that I felt very grateful for the little cucumber with yoghurt-like dressing on the plate. If you can’t handle the spice, don’t dip your cutlet into the sauce. We opted for kobu-jime kamo no kunsei yaki, kinkan to kaki, smoked duck breast with barley miso and kumquats, rather than for the wagyu as we enjoyed plenty of stunning beef while in Japan. It’s such an amazing piece of meat, it melts in your mouth and no matter how much you have, you always want more. 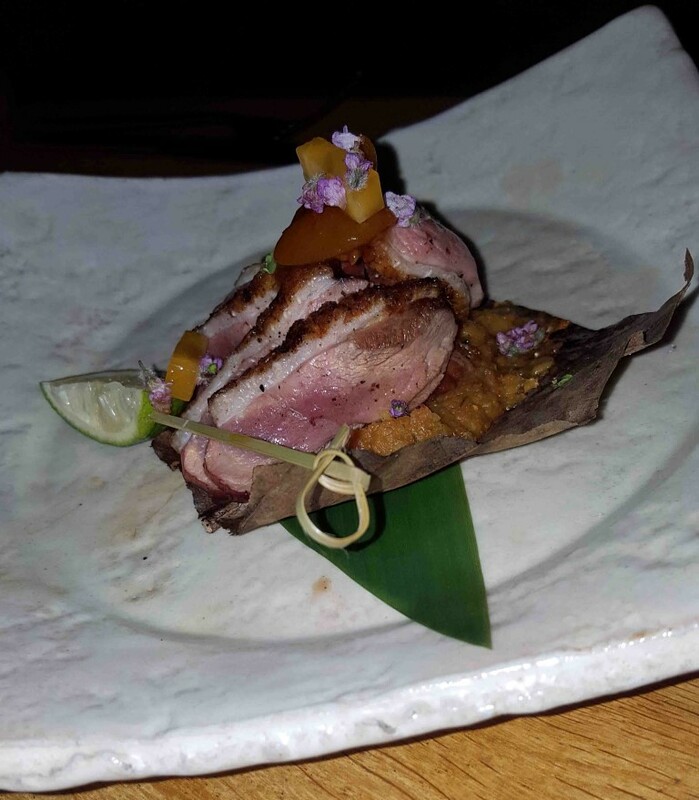 But the duck we had at ROKA was superb as well. Still pink as it should be and delicately decorated with small edible flowers. It was a real treat. 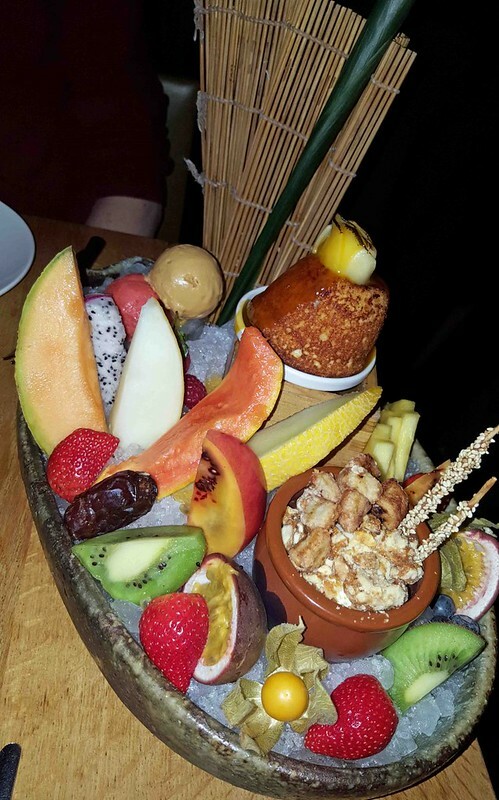 Once the dessert came out, we were left speechless. 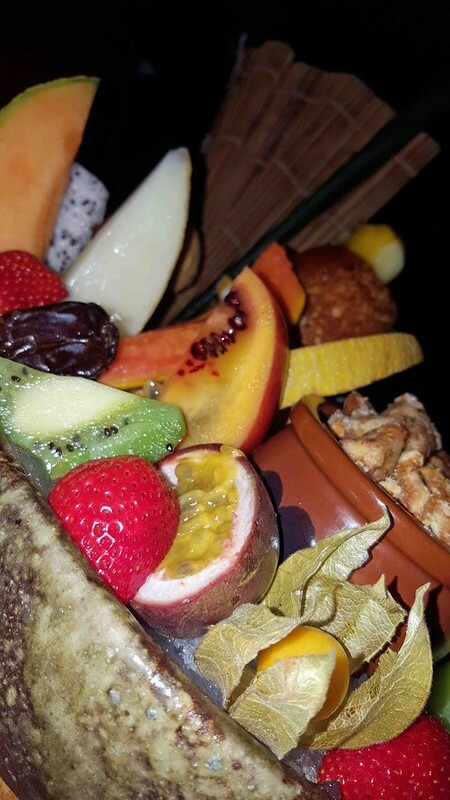 A bowl filled with ice, sorbet, everyday and exotic fruits, cake, it was a work of art. Tsubo iri tonyu to chocolate, peanut, vanilla and chocolate sundae, sesame poki sticks was not only tasty, I loved the different textures of the dish. Yoghurt to almond no cake, miso no caramel ice to mango toffee, yoghurt and almond cake, mango toffee caramel miso ice cream, was so light I could keep eating it and ichigo to suika no chawan mushi, ichigo to jasmine aisu, strawberry and watermelon chawan mushi, strawberry jasmine ice cream, kept us guessing at the ingredients. Ben’s done an amazing job selecting ROKA as the place for my birthday dinner. It didn’t just remind us of the fabulous time we had in Japan, it introduced us to new flavour combinations and I’m sure we’ll be back soon. 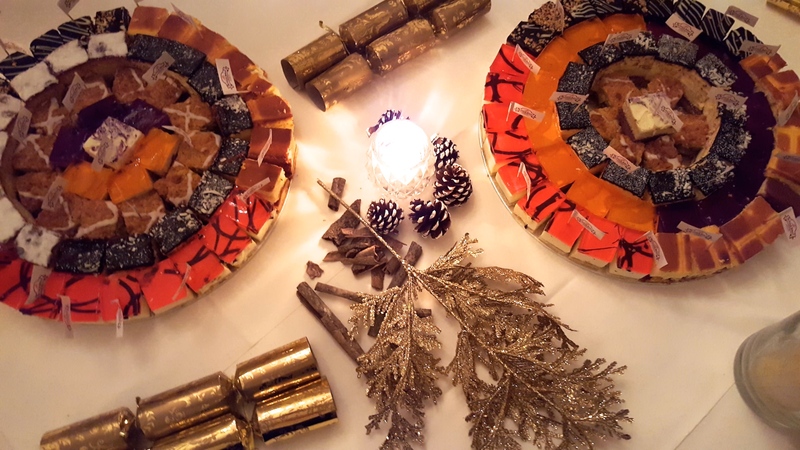 The only regret I have is that the light isn’t blogger friendly, so the photos just don’t seem to do the food justice. 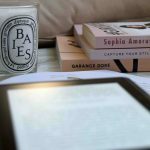 So, You’re Pregnant, Now What?